Regular annual increases of 3-4% and a promotion for another 5% or so. Total change in salary was about 12%. Left because I realized I didn’t want to be an electrical engineer forever, and I didn’t feel challenged. Started by taking a 4.5% pay-cut from my first job. Two annual increases of 3-4% and a 5% increase for a promotion. Total change in salary of about 6.5% from my final salary at my first company. Laid off after three years with the company; out of work for about five months. Started at 7% below my salary after my first stint. I estimate I would have gotten an 8% increase if I had stuck around. This would’ve put me right back at my ending salary after my first stint in 2009. Final salary at my second company (April 2011) would have been about 7% higher than my final salary at my first company (September 2006), and about 20% higher than my first salary right out of school (January 2004). To put this in perspective, cumulative inflation from January 2004 through March 2011 was 20.66% (calculator here). So although my salary was 20% higher than it was when I started my first job in 2004, I was actually not making any more money because inflation had slightly outpaced my salary growth. 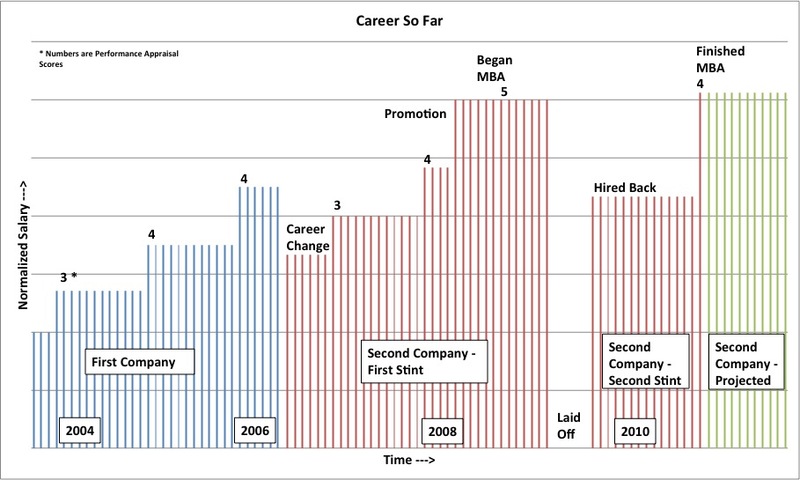 My educational background allowed me to start out at a good pay level when I finished college, but despite seven years of professional experience and an MBA, I had not made real progress. Something just wasn’t tracking. Although my past career seemed relatively flat, I realized my future career prospects could be very bright at my company. I had put in five years and spent time in several major parts of the business. I had become a subject matter expert in several areas. 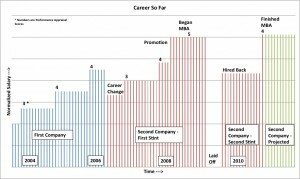 So about six months ago, I started looking around to see what opportunities there may be for a new MBA at my company. I looked everywhere and exhausted every option I could think of. I talked to my managers, executives and managers in other departments. In the end, I just couldn’t see how to build a really strong, successful career at my company. All I could see were lateral moves and small bumps in pay. That wasn’t what I had in mind when I enrolled for an MBA. A couple of months ago, I began to understand why there was a disconnect between the progress I’ve made and where I want to be. It was initially very frustrating to feel I was more valuable than my responsibilities or paycheck indicated. I often thought, “A guy with a couple engineering degrees and an MBA should be making more than this.” This wasn’t (entirely) my ego talking – I’ve invested almost eight years and about $70,000 of my own money in my education. I need to ensure that I get maximum return on that investment. I looked at my market value and experience, and just couldn’t reconcile those things with my actual pay and responsibilities. I wanted to know that I was really building a lucrative career that would eventually allow me to be a serious, well-paid decision maker. As I started poking around and trying to find a path forward at my company, I simply couldn’t figure out how to make it work. But then something dawned on me and made everything easier to understand: The way I was assessing my value as an employee was different than my company’s methodology for assessing my value as an employee. What I had to offer was not as valuable to my company as it might be to other companies. I can’t say I was over-qualified for the jobs there, but I was other-qualified. If a car mechanic is used to making $60 an hour, and he goes to Starbucks to get a job, he can’t expect to make $60 an hour because Starbucks doesn’t need car mechanics. Starbucks needs baristas, and they pay them much less than $60 an hour. Car mechanics are not explicitly valuable to Starbucks. And that’s when I realized it was time for me to leave.